Driving to another meeting in Sicily, without much time to spare, we suddenly came across twenty or so burly men who had set up a road block, strikers protesting the closing of the local plant of an oil company and the subsequent loss of jobs. A long line of drivers were arguing that they should be let through: I imagined kids waiting to be picked up at school, aged parents hanging around hospital waiting rooms, concerts, meals and homework missed. But the strikers were adamant. “Wait here till we open the road. This is important to us.” Nevertheless, my driver inched forward until we were alongside the strikers’ leader. “Where are you going? Stay in line with everyone else,” he was told brusquely. “I’ve got the father of Nicholas Green with me, the American child who was shot on the freeway in Calabria. He’s going to give a talk on organ donation at a school,” my driver replied. A skeptical face ducked down by the window, looked at me quizzically, then smiled broadly. “Let this one through,” he said to his pals and waved us on majestically. On a recent visit to Sicily, where four of Nicholas’ recipients live, I was invited to speak to the kindergartners at the Rita Atria School in Palermo, who listened breathlessly to the tale of a boy, just a year or two older than themselves, who saved other children when no one else in the world could. Afterward I talked with the principal about the visit Maggie and I made to the same school 21 years ago and were received with the same rapt attention then too. It dawned on me that these were the little children of the little children we talked to on that first visit: a whole generation of families for whom Nicholas has been part of their lives. “The day Nicholas died, October 1st 1994, Maria Pia was only 19 years old and she was dying. Only a transplant could save her. Looking at her now, a vigorous mother of two lovely children and wife to a loving husband, tears come to my eyes thinking that, if my wife Maggie and I had made a different decision that day, nothing of this would be possible. If we hadn’t helped her and the others, I know we would never have forgiven ourselves”. Twentyone years have passed since Maria Pia Pedalà, in her final hepatic coma in a hospital bed, was saved at the very last moment by a liver transplant: the donor of the organ and of a new life was an American child, Nicholas Green, only seven years old, who was vacationing with his family in Italy and was declared brain dead after having been shot on September 29 1994 by two robbers along Salerno-Reggio Calabria Highway . 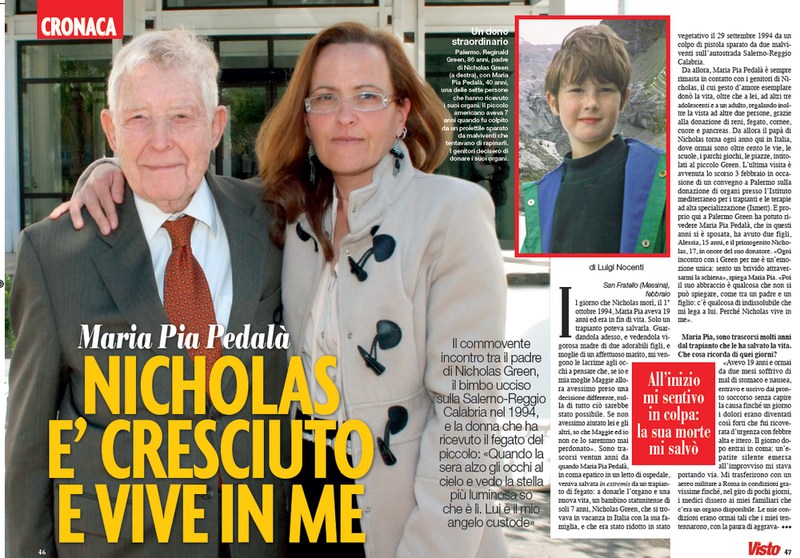 Since then, Maria Pia Pedalà has kept in touch from time to time with Nicholas’ parents whose deed of love gave a new life to her and to other three teenagers and an adult, and also sight to two more people thanks to the donation of the kidneys, liver, heart, corneas and pancreas cells. 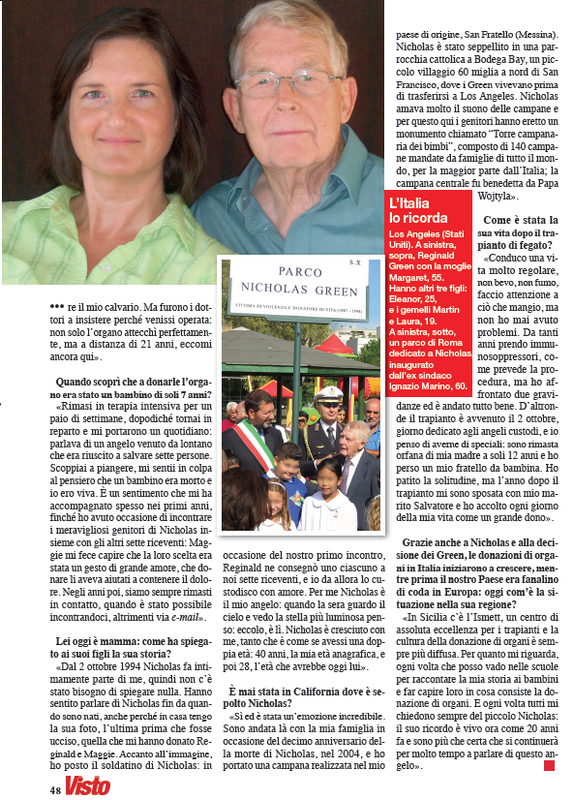 Since then, Nicholas’ father comes to Italy every year – where more than 100 places including streets, schools, parks, squares have been named for the little Green child. The most recent visit took place on February 3rd, on occasion of a conference on organ donation organized in Palermo at the Mediterranean Institute for Transplants and Special Treatments (ISMETT). And right here in Palermo, Green met Maria Pia Pedalà again. Over these years she married and had two children, Alessia, 15 years old, and Nicholas, 17, who got his name to honor her mother’s donor. “Every meeting with the Greens is a unique emotion for me: I feel a shiver running down my back” Maria Pia explains. “His hug is something you cannot explain, like that of a father to a son: there is something indissoluble that ties me to him because Nicholas lives in me. Q: Maria Pia, many years passed from the transplant that saved your life. What do you remember of those days? Q: when did you discover that your donor was a child only seven years old? Q: You are a mum now: how did you explain your story to your children? A: “Since October 2nd 1994 Nicholas is part of me, therefore there was no need to explain anything. Q: Have you ever been in California, where Nicholas is buried? A: “Yes, and it was an incredible emotion. I went there with my family on the 10th anniversary since Nicholas had died, in 2004, and I took there a bell made in my hometown, San Fratello. Nicholas was buried in a catholic church in Bodega Bay, a small village 60 miles north of San Francisco where the Greens lived before moving to Los Angeles. Nicholas loved the sound of bells and that’s why his parents built a monument, The Children’s Bell Tower, made with 140 bells sent by families from many parts of the world, mostly from Italy; the central bell was blessed by Pope John Paul II. Q: How is your life after the transplant? A: I live a very regular life, I don’t smoke, don’t drink, I am careful about what I eat, and I have never had problems. For many years I have taken immunosuppressant medicines, as the procedure requires, but I have been pregnant two times and everything went well. On the other hand my transplant took place on October 2nd, the day dedicated to the guardian angels and I think I have some very special guardian angels: I lost my mother when I was 12, and I lost a brother when I was a child. I suffered loneliness, but a year after the transplant I married my husband Salvatore and I welcome every day of my life as a gift”. Q: Also thanks to Nicholas and the decision of the Greens, organ donations in Italy started to grow. Until then our Country was at the very bottom in Europe: how is the situation in your region now? Article published on Visto magazine (Italy), February 19, 2016. The Policlinico Gemelli hospital, connected to the Catholic University of Rome, says “The Nicholas Effect” video (available at www.nicholasgreen.org under DVDs) is the most frequently-watched item on its website, even in competition with universal killers like cancer or headline grabbers like Zika. Within days of Nicholas being killed, Italian communities of all sizes, from some of the largest cities to small villages began to talk about naming places for him. Twenty-one years later, 110 have been identified: streets, schools, parks, squares, and one bridge, all over Italy. Please click on any tab for more information.